Freekeh is young ‘green’ wheat that goes through a smoking process; it’s a little chewy, a little nutty and super delicious. I much prefer it to bulghar wheat so feature it in tabbouleh. It’s a tasty substitute for quinoa and rice too – make risottos, pilafs and salads with it, for example. In fact freekeh rivals quinoa on the protein front, but remember, it is wheat – albeit the grains are harvested early – and therefore not gluten free. 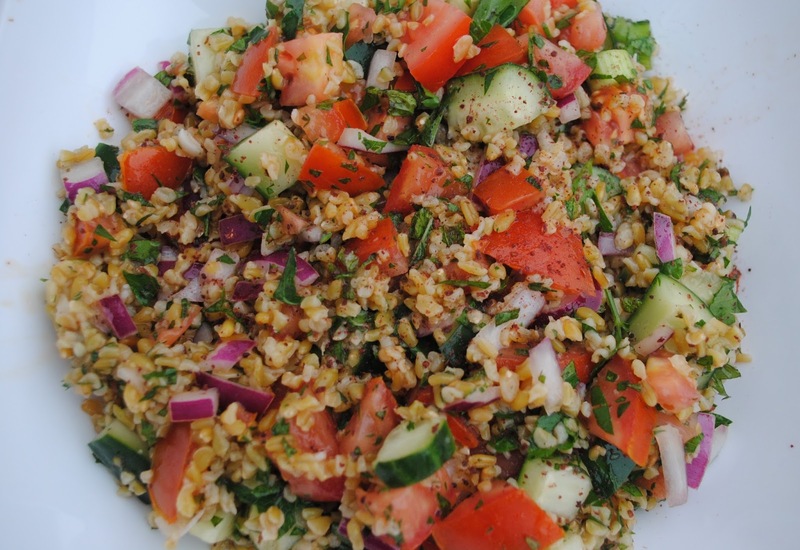 Tabbouleh is super-fast – just 5 simple steps here! It is also a great receptor for a fridge clear out: most crunchy raw vegetables – diced into bite-sized pieces – work well. I’ve added sumac too; it’s a tangy, colourful spice which works well with the refreshing flavours, plus is widely used across Levantine cooking, hence playing to the origins of Tabbouleh. Whilst pomegranate seeds are a popular topping, I usually garnish this salad with pistachios. Apart from being one of my favourite nuts, they look pretty and their slightly smoky taste works well with the freekeh. Boil the freekeh in about a litre of boiling water, with a pinch of salt, for 15 minutes. Make the dressing by crushing the garlic cloves and whisking up with the other ingredients. When the freekeh is cooked, drain well and stir in the dressing. Dice the vegetables and add. Just before serving, finely shred the herbs, garnish with pistachios and an extra sprinkle of sumac, and you are good to go! I have linked this recipe up to No Waste Food Challenge hosted by Elizabeth’s Kitchen Diary. Sounds very seasonal! Love it =) I am really digging all of the fresh herbs I can get my hands on right now and this salad uses some! It is handy for a fridge clear out! MMm this sounds so lovely! Thank you for sharing with the No Waste Food Challenge!